A winter tour in Scotland certainly has plenty of atmosphere, sometimes by way of the uncertain or dramatic light, the sudden surprise of a clear crisp day - or even an unseasonal mildness that defies the Scottish weather stereotyping. However, bear in mind the obvious: the further north in Scotland you travel, the shorter the days, naturally. It's the downside of them being longer in the north in summer! (I wrote this at 4.30pm on 26 November, for instance, a little way south of Edinburgh and it's already pretty dark out there.) This has obvious implications for a winter tour. If you want to take an organised tour, we’d say use Rabbies. There’s an example of a 2-day tour on that link that would make a good winter excursion - but they run a variety of small friendly group tours of various lengths throughout the year with departures from Edinburgh, Glasgow and Inverness. It’s simply the brief hours of daylight in winter that means I recommend a winter tour basically as a foray from central Scotland to the north, but not too far. So let’s assume, for example, you already have spent a day or two in Edinburgh and seen the Edinburgh must sees. If you have the flexibility of a hire car, then you can do both parts of this winter tour through East Lothian. If you go by public transport, then take bus or train to North Berwick and make a day of it there. This little resort town, with its comfortable well-to-do air, has always been a popular excursion from the city. (Pictured here) Winter light over Fidra, by North Berwick, East Lothian. This little island is just one of several in Scotland that was said to be the inspiration of Robert Louis Stevenson’s ‘Treasure Island’. Certainly, RLS knew the area well: Gullane Sands, a little to the west, is the setting for an exciting chapter in his ‘Catriona’. If it’s a brisk wintry day then wrap up well and spend a few minutes strolling on the fine sandy beach that runs out to the west of North Berwick. The Seabird Centre is a good choice if you have young children. Otherwise, enjoy the little boutique shops and have a light (and early) lunch. We like The Westgate Gallery’s Orangery Cafe and especially the dog-friendly Charlie's Cafe in the High St. The beach at West Bay at North Berwick - and only a short walk to the town centre. And one more thing...if you're driving late in the day in winter, then best to have a reliable torch. (Have you ever tried changing a wheel in the dark?) My trusty torch is an LE 1000lm USB Rechargeable LED Spotlight. I got it via Amazon and so will you if you follow the link(!). (Below) View west up Strathearn on a winter’s day, from the top of the Knock Hill, Crieff, Perthshire. You can be lucky on a winter tour in Scotland and catch those still high-pressure days after snow. The snow-level here looks around, say 400 m or 1200 ft but with hard frost in the strath (broad valley) below. (Pictured here) On your winter tour you would enjoy the road west of Crieff in Perthshire - see Strathearn in the snow. View from the top of the Knock Hill, Crieff, westwards along the valley of the River Earn - or Strathearn. Should it, by chance, not be raining in Crieff, you could catch a wintery sunset and great views from the top of the Knock Hill above the town – a short walk from the car-park above the Crieff Hydro Hotel and well worth the effort. So, for your overnight, it’s either Perth or Crieff. Just a reminder that winter days are short especially in the north of Scotland. On the shores of the Moray Firth, looking west, it’s around 15.30hrs on the 9th December, after a clear day. The sun is down, car headlights are on, the ground is in deep twilight (aka ‘dark’). And there are still 12 days to go until the winter solstice. Perthshire touring is made easy with a choice of picturesque loch-filled glens with good roads running east-west. Head for the Sma’ Glen, reached by turning north on the A822 at Gilmerton, east of Crieff (so, west of Perth). This is an old Scottish cattle droving route from the days when large herds of fat cattle were driven south to market in autumn. The Sma’ Glen is just Scots for small, pronounced ‘smaa’ with a long vowel, and it gives a hint of Highland grandeur and you have a careful decision to make: at Amulree, a lonely cluster of houses amidst the moors, you can take an adventurous little road north-westwards to Kenmore at the east end of Loch Tay. (Pictured here) The high road through Glen Quaich from Amulree, with Loch Freuchie in the distance. This is a view in March, and I’m not even sure it was passable a few weeks before! This is fair-weather winter touring. Take care – be cautious! Check road reports. Now, I’d only like you to drive this part of your winter tour if the weather is good. There are fine views of moorland near at hand and the Ben Lawers range to the north-west, before the little road zig-zags (and I mean zig-zags) down to the village of Kenmore. 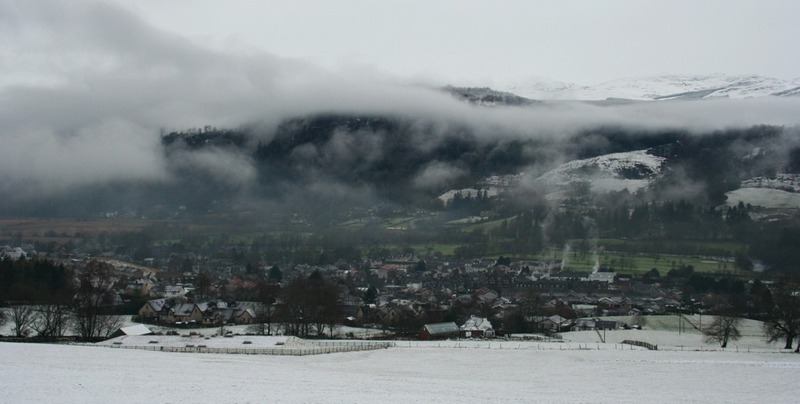 But it does cross high ground, so if there has been any snowfall higher up, instead keep to the main roads and head for Aberfeldy, pictured here on a grey afternoon in January. It looks as though the clouds are probably not going to clear and it may snow again. In fact, looking back, I think it did. In fact, we’ve nominated the Birks of Aberfeldy on our list of romantic places in Scotland. If you decide to turn west in this winter tour for the extra leg to Kenmore and a view of Loch Tay, you’ll probably find yourself at the Mains of Taymouth Courtyard, an upmarket deli and Scottish shop with cafe, restaurant and bar – just what you’d expect, really, in plush Perthshire. Next, circle eastwards from Kenmore or Aberfeldy, down river for the main A9 ‘the Highland Road’ at Ballinluig. If there is daylight left in the sky, you could extend the winter tour as far as Pitlochry, but I guess, it’s into the afternoon by now, so there is just light enough for you to turn south, stopping off at Dunkeld to admire its cathedral and attractive ‘Little Houses’ nearby. Then it’s back to Perth/Crieff for overnight. 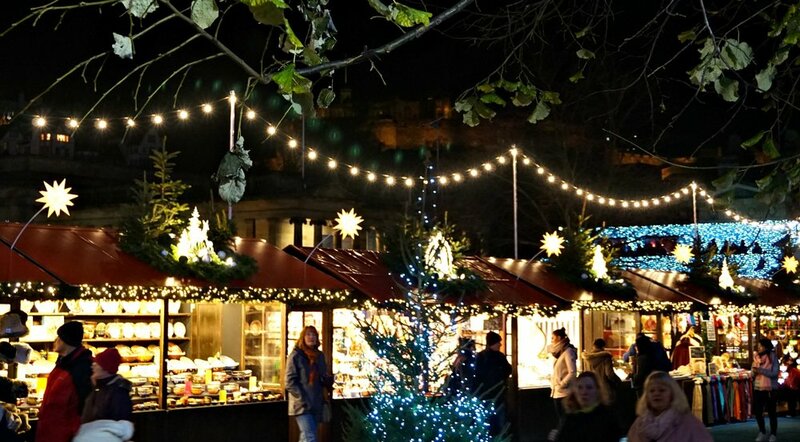 This is Edinburgh and their Christmas Market. Just a reminder that there is plenty to do in the cities. Many have these continental-style markets, though things may get a little complicated for the operators in the future if England pulls Scotland out of the EU against its people’s wishes. Anyway, this picture is a reminder that a winter visit to Scotland might not even have to include touring at all! Next day, by way of taking it easy and not hurtling all over the countryside, you could take in the excellent Perth Museum and Art Gallery, or have an early lunch at Cafe Breizh – a French restaurant with a Breton slant and a real air of enthusiasm and welcome – they serve delicious galettes. (It’s certainly our favourite eating place in Perth. Oh, except for Pighalle, their other restaurant, also in Perth. We’re great fans. But then, Cafe Tabou is also good….heck, there are so many nice places hereabouts.) Then head by fast roads back to Edinburgh – in about an hour. Remember: if it's winter, check the driving conditions at TrafficScotland. Who can say what a Scottish winter will bring? The snow comes early, late or not at all. If the days are that little bit longer, then take a look at this more extensive autumn tour - or maybe you’re interested in Scotland in springtime!